Giongo S, Oliveira Longa CM, Dal Maso E, Montecchio L, Maresi G (2017). Evaluating the impact of Hymenoscyphus fraxineus in Trentino (Alps, Northern Italy): first investigations. iForest 10: 871-878. The spread of Hymenoscyphus fraxineus has been causing great concern regarding the survival of European ash (Fraxinus excelsior) throughout Europe since the 1990s. 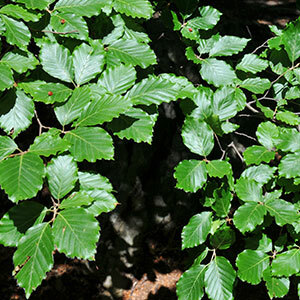 The disease was first recorded in Trentino (southern Alps, Italy) in 2012 and has spread throughout the mountain landscape, where ash trees are scattered in small and isolated stands in different valleys. The status of the disease was checked by monitoring the damage to natural regeneration and adult trees in 90 sites spread over the whole region. The survey confirmed the complete colonization by the pathogen of the whole investigated area, with high levels of damage to both young and adult ash trees. Regeneration (both seedlings and saplings) was observed to be affected by the fungus in 88 plots out of 90. Out of 4486 examined young European ashes, 2261 (50.4%) were affected and 789 (17.6%) were already dead. Ten of the 384 assayed flowering ashes (Fraxinus ornus) showed symptoms on branches and apical stems, similar to those observed for European ash. Isolation and molecular analysis proved the presence of the fungus on both symptomatic European and flowering ashes. The examined 386 adult trees showed different levels of damage, sometimes reaching more than 75% of the crown. Some individual trees (42) growing close to severely damaged trees appeared fully healthy, which suggests the possible existence of some resistant/tolerant individuals in the examined populations. Modelling spatiotemporal patterns of dubas bug infestations on date palms in northern Oman: a geographical information system case study. Crop Protection 93: 113-121. Hymenoscyphus fraxineus, the correct scientific name for the fungus causing ash dieback in Europe. IMA Fungus 5: 79-80. Risk of natural spread of Hymenoscyphus fraxineus with environmental niche modelling and ensemble forecasting technique. Forest Research 3: 131. Efficacy tests on commercial fungicides against ash dieback in vitro and by trunk injection. Urban Forestry and Urban Greening 13 (4): 697-703. Temporal development of ash dieback symptoms and spatial distribution of collar rots in provenance trial of Fraxinus excelsior. European Journal of Forest Research 132: 865-876. Ash dieback in Germany: research on disease development, resistance and management options. In: “Dieback of European Ash (Fraxinus spp. ): Consequences and Guidelines for Sustainable Management” (Vasaitis R, Enderle R eds). Swedish University of Agricultural Sciences, Uppsala, Sweden, pp. 89-105. Growth performance of dense natural regeneration of Fraxinus excelsior under attack of the ash dieback agent Hymenoscyphus fraxineus. Baltic Forestry 23 (1): 218-228. ArcGIS Desktop, release 10. Environmental Systems Research Institute, Redlands, CA, USA. From the Alps to the Apennines: possible spread of ash dieback in Mediterranean areas. In: “Dieback of European Ash (Fraxinus spp. ): Consequences and Guidelines for Sustainable Management” (Vasaitis R, Enderle R eds). Swedish University of Agricultural Sciences, Uppsala, Sweden, pp. 140-149. Differences in susceptibility to ash dieback in Czech provenances of Fraxinus excelsior. Forest Pathology 46: 281-288. A small plot study of Chalara infestation in a recently established natural stand of ash, UK. Arboricultural Journal 38 (3): 122-133. Detection of Chalara fraxinea from tissue of Fraxinus excelsior using species-specific ITS primers. Forest Pathology 40: 111-115. First definite report of natural infection of Fraxinus ornus by Hymenoscyphus fraxineus. Forest Pathology 45 (5): 430-432. Further observations on the association of Hymenoscyphus fraxineus with Fraxinus ornus. Baltic Forestry 23 (1): 60-67. Adaptive potential of ash (Fraxinus excelsior) populations against the novel emerging pathogen Hymenoscyphus pseudoalbidus. Evolutionary Applications 5 (3): 219-228. The ash dieback pathogen Hymenoscyphus pseudoalbidus is associated with leaf symptoms on ash species (Fraxinus spp.). Journal of Agricultural Extension and Rural Development 4: 261-265. Changes of young ash stands area in Latvia and invasion of Hymenoscyphus fraxineus. Proceedings of the Latvian Academy of Sciences, Section B 70 (3): 124-130. Ash dieback due to Hymenoscyphus fraxineus: what can be learnt from evolutionary ecology? Plant Pathology 65: 1056-1070. Situation with ash in Italy: stand characteristics, health condition, ongoing work and research needs. In: Interim Report from the Meeting “Chalara fraxinea, FRAXBACK” (Mainprize N, Hendry S, Weir J eds). Vilnius (Lithuania) 13-14 Nov 2012. Forestry Commission, Bristol, UK, pp. 25-26. First record of ash dieback caused by Hymenoschyphus fraxineus on Fraxinus excelsior in the Apennines (Tuscany, Italy). Plant Disease 100 (2): 535. Can pruning help maintain vitality of ash trees affected by ash dieback in urban landscapes? Urban Forestry and Urban Greening 27: 69-75. Rapid invasion by an aggressive pathogenic fungus (Hymenoscyphus pseudoalbidus) replaces a native decomposer (Hymenoscyphus albidus): a case of local cryptic extinction? Fungal Ecology 5: 663-669. Spatio-temporal dynamics on a plot scale of cocoa black pod rot caused by Phytophthora megakarya in Cameroon. European Journal of Plant Pathology 147: 579. First report of Chalara fraxinea on common ash in Italy. Plant Disease 94 (1): 133. Natural regeneration of common ash in young stands in Latvia. Baltic Forestry 23 (1): 209-217. Silvicultural strategies for Fraxinus excelsior in response to dieback caused by Hymenoscyphus fraxineus. Forestry 90 (4): 455-472. Water stress and Sphaeropsis sapinea as a latent pathogen of red pine seedlings. New Phytologist 149: 531-538. Anatomical and genetic aspects of ash dieback: a look at the wood structure. iForest 10: 522-528.